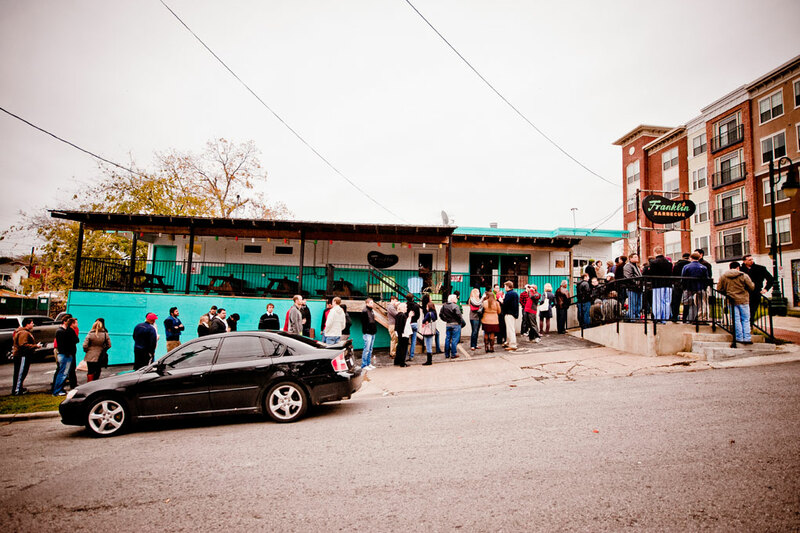 One morning our (adult) kids had plans which didn’t include their parents, so Mom & Dad decided to spend the morning standing in line at the famous Franklin Barbecue (located at 900 E. 11th St.). Franklin started as a food truck in a parking lot back in 2009 and has grown into a brick and mortar restaurant that is open 6 days a week (closed Mondays) for only about 4 hours each day. Why only a few hours? Because that’s all it takes for them to sell out of about 1,800 pounds of brisket (their daily average according to an article I read). And while they do sell other barbecued meats (sausage, ribs, pulled pork and turkey), their brisket is supposedly the star of the show. Consequently the line of people was about two blocks long at 9:00…and they don’t open the door until 11:00! People were sitting in lawn chairs reading the paper, surfing the net on their iPads or laptops, and even some were playing checkers. They brought with them coolers of drinks, coffee, donuts, and other sustenance. This was obviously not their first “Franklin” rodeo. They came prepared to pass the time…hours of time! But we were newbies, so brought nothing. Luckily we struck up a conversation with the nice couple behind us. They were from Iowa. We are from Illinois so we’re practically neighbors, lol. After conversing with them for more than 3 hours we felt like we’d known each other forever. Yes, it was probably noon before we finally actually made it inside the door, where there was still a line to stand in but at least you can actually see the finish line. We had planned to get some pulled pork or ribs in addition to brisket but they had ran out of both of these long before we reached the order counter. They had surveyed the line around noon to get an idea of when they would run out of brisket (aka where to cut off the line). Because who wants to deal with a bunch of hangry people who’ve stood in line for hours only to be turned away “brisketless”? The line had been cut off not long after us. So not wanting to be brisket hoggers, we ordered the amount of brisket we had said when surveyed and then ordered sausage too (the only other meat they still had). Because after all, we had stood in line way too long to come away with just a few measly pounds of meat. So was it worth it? Well, I’m not going to lie and say that the brisket was not good. It was good. But I can also not say that it was good enough to warrant spending that amount of time and money. Oh, and I didn’t really like the sausage…too greasy. But anyway, it was an Austin experience…one that needed to be done I suppose. Now I can say, “Been there, done that!” and don’t really need to do it again. And that just leaves our rating. Without the long wait in line, I would give the Franklin brisket 4 stars. But with the wait, I would deduct 1 star and give it a 3. 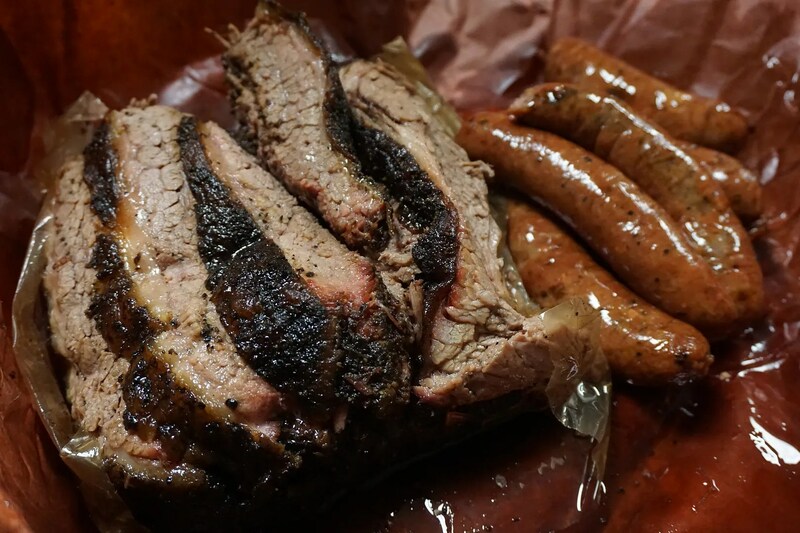 However, apparently a majority of Trip Advisor reviewers disagree with me because Franklin Barbecue has a 4 1/2 star rating and ranks #6 of the more than 2,500 Austin restaurants reviewed. 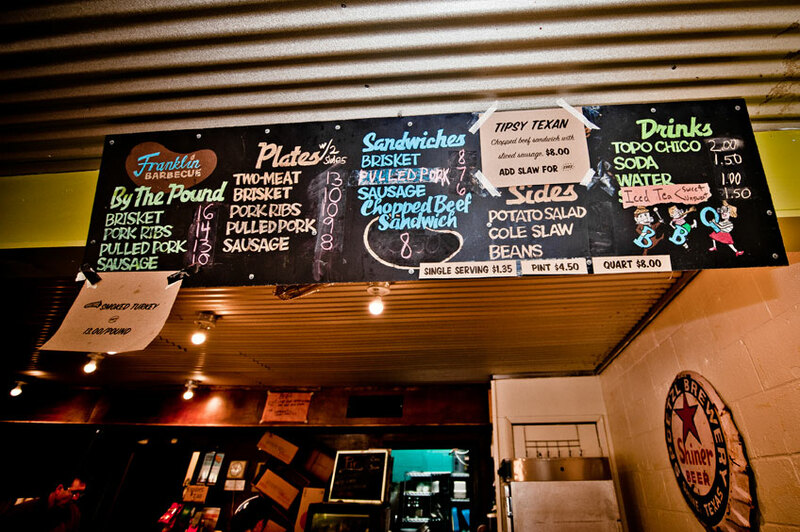 Yelp reviewers too gave Franklin 4 1/2 stars and ranked it incredibly high as the #2 best restaurant in Austin. So I guess there is no end to that Franklin line in sight.